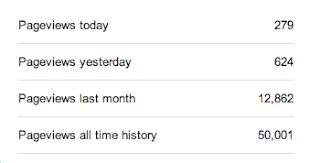 Writing About Writing (And Occasionally Some Writing): 50,000!!! Thank you!!!! 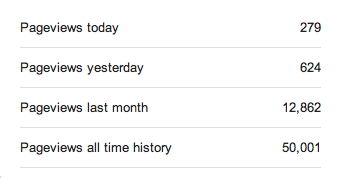 Fifty thousand page views!!! Fifty. Thousand. That's like the population of San Louis Obisbo (including some tourists even!). It still blows me away. It wasn't even nine months ago that I was completely excited about getting twenty hits in a given day. I knew we would make it here, but I honestly thought it would take two or three years to get to this point, not ten months. And it's all because of you guys! Of course, it's every time you clicked the link for solidarity or just because it was me (even though you weren't REALLY that interested in writing). But it's more than that too. Even as obnoxious as I am about pimping W.A.W. out on social media, over half of these hits come from all of you! When you "+1," "Upvote," or "Like" an article, it gains lots of traction in how far and wide it goes (and how quickly it gets there), and if even one or two of you actually share an article, it does amazingly well. Several of my top ten articles happened because a small handful of you (three or four) just hit the "share" button on G+ or Facebook. So I can't thank you all enough. Our success is as much about you guys being awesome as me doing my thing--maybe even more. I don't know if I'll keep growing or plateau or just finally dwindle to a trickle instead of going to bed each night looking at numbers that a month before were our upper ceiling.